As a mom of four little ones- I have tried about every organizational tool out there. And while I know that everyone has their technology these days- (iPhone, Blackberry, computer), there really is nothing like being able to look at your schedule in plain old ink, on plain ol’ paper. My fav planner on the planet is the momAgenda. Hands down. They just arrived in the shop today. The colors are beautiful, the cover material luxurious, yet kid proof. The layouts of the day, week, month pages are just ingenious. You need to come in and take a look for yourself. I’ve been using them for 4 years and I have kept every one. I don’t have scrapbooks or journals or diaries. 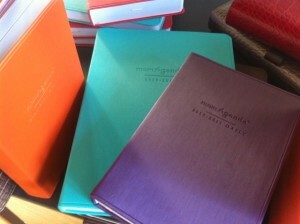 I have the momAgendas- they have become my life recorded on paper. There are different inks and varying degrees of messy writing depending on how hectic the day was. Exclamation points, sad faces, spit up (gross only if you’ve never had babies), and probably more than a few coffee stains. It all makes for a very real and very awesome account of your life.